At Bergen Premiere Dentistry, we help patients who suffer from missing or damaged teeth through advanced dental technology and expertise in full or partial dentures to help restore your smile. Tooth replacement is a high priority in your life because it impacts your quality of life– appearance, confidence, as well as digestive health. 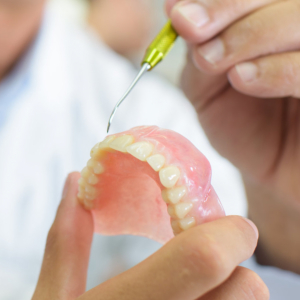 Dentures are custom-made removable prosthetic solutions that are natural-looking and carefully made to fit comfortably against the surrounding gum tissues. Tooth loss can affect the shape of the gum and bones after a prolonged period of time. Dentures can be adjusted or modified to adapt to these subtle changes. Our experienced dental team can determine the best option to replace your missing teeth. We offer both partial and full denture services. Full dentures are removable dental prosthetics that are excellent options if you are missing all of your upper and/or lower teeth. 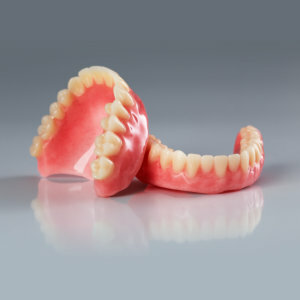 Full dentures are custom molded to fit snugly against the gum tissue and the jaw. The base is usually made of acrylic or plastic and outfitted with natural-looking artificial teeth and fresh-colored gum. Dentures are made to latch onto the gum line to stay in place. At Bergen Premiere Dentistry, we create dentures that don’t only look natural, but also durable and function like natural teeth. Full dentures help restore quality of life as they allow you to eat, talk and smile confidently. You’re a good candidate for partial dentures or bridges if you are missing multiple teeth, even if they are on opposite sides of your mouth. If you have adjacent strong natural teeth, a dental bridge is an ideal solution because the false teeth can be anchored to them. They are called dental bridges because they bridge the gap between two teeth. A base made of a metal framework is used to secure partial dentures in place, preventing it from falling when you talk, bite and chew. We provide temporary dentures for patients who are undergoing cosmetic dentistry procedures, such as dental implants, to ensure you keep a natural-looking smile while you wait for the treatment to be completed. This is also an ideal solution for patients whose teeth are accidentally knocked out while playing sports. 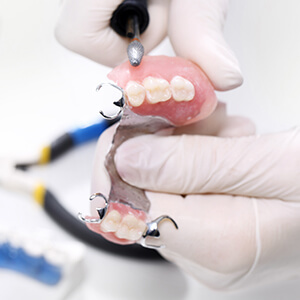 Temporary dentures are usually secured in place with metal wires that function like retainers and can be removed anytime. With highly-experienced and caring dental team, convenient office hours and flexible appointment scheduling, Bergen Premiere Dentistry is the dental practice to turn to if you’re looking for durable and natural-looking dentures in Ramsey, NJ. Call (201) 746-4614 today for more information or to schedule your appointment.